If the Butterick/ McCall’s/ Vogue or Simplicity/ New Look and Burda, Kwik Sew, or Neue Mode patterns don’t warm your heart, why not explore smaller pattern design companies. Most of them focus on a particular style. As a wild overgeneralisation, I look to USA-Canada companies for classic tailoring, comfortable casuals, historic/ vintage reproductions, or art-to-wear, and for specific sports. And to European pattern companies and pattern magazines for more chic or fashion-forward styles. But I can immediately think of companies which don’t fit that, and your preferences are probably different from mine ! 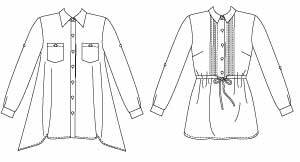 – some links to lists of USA-Canada independent pattern companies. There are so many of these companies, I gladly leave it to others to keep track of them all! – USA on-line retailers. Again there are many of these, so I’ve tried to limit them to ones which carry pattern lines not in the big lists. – European on-line retailers of USA-Canada patterns. So we can save ourselves postage and customs. Happily there are more of these than I thought. – European independent pattern companies. I’ve listed all the ones I can find, as they’re less well known and I’d like to support them. – a little about European pattern magazines and on-line sources for them. Some of these pattern lines have discussion threads at Stitchers Guild, where you can get advice, news, and encouragement ! wholesale wearable art patterns, provides more names for you to follow up ! Patterns : Folkwear, Jalie, Laughing Moon, Sense & Sensibility, Timely Tresses. Patterns : Colette Patterns, Hot Patterns, Serendipity Studio. Nerybeth Crafts. See Amy Butler under Categories on left. List of pattern companies is under Schnittmuster nach Hersteller. I can’t get Google translate to work with this site reliably. Patterns : Amy Butler, Favorite Things, Folkwear, Green Pepper, Indygo Junction, Jalie, Jean Hardy, Lingerie Secrets, Marfy, Olympia, Onion, Past Patterns, Pattern Company, Revisions, Schnittquelle, Sewing Workshop, Shapes, Suitability. Naaipatronen site in 3 languages, items sent from Netherlands. Patterns : Burda in 7 western European languages (not English), Amy Butler, Folkwear, Jalie, Jean Hardy, Kayla Kennington, Laughing Moon, MaMu, Marfy, Mediaeval Miscellanea (Period Patterns), Pattern Company, Ragstock, Revisions, Sense & Sensibility, Suitability, Truly Victorian. Pattern magazines : single issues of Burda, Burda Easy, Burda Plus (in Dutch), KnipMode (Dutch), Ottobre (Dutch and English). Dots n’ Stripes (UK) has Ottobre magazine in English. Patterns : Jalie, Jean Hardy, Onion, Simplicity in German. Pattern magazines : single issues of KnipMode (Dutch), La Mia Boutique (Italian), Ottobre (in English and German), Patrones (Spanish). Also Sew Stylish and Threads magazines. Burdastyle.de (Germany) for Burda magazines in German. Coudre-Broder-Tricoter (France) has Burda, Burda Mode Plus, Burda Couture Facile magazines in French. Revistasedomicilio.es for Patrones, and Burda in Spanish. Marfy patterns are available in the US from Vogue patterns, where you can see the full range of patterns. They’re also available through the Fashion Sewing Group. Chic elegance. Pattern only, no instructions. Individual sizes. Instead look at the Fjoelner site for descriptions in English. 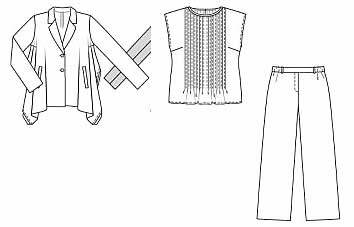 Wardrobe and other multi-style patterns for modern casuals. Current styles in individual sizes, mainly for felted and other fabrics with two good sides. Stoff & Stil site in English. Relaxed styles in individual sizes. There are also several pattern companies for lingerie and childrenswear, some at Naaipatronen above. I keep coming across European pattern companies. If you know of any that are available on-line which I haven’t included, please tell me about them ! Simply Pretty for Japanese pattern books and magazines. Pattern Review (members only) 2008 article on international pattern magazines – ‘International Superstars’ by Cidell. Cidell gives US sources available at the time, but some links are now out-dated. Burda (English) and Modellina (Italian, Spanish, French) subscriptions from OPR in New York City, and Universal News. Burda is on newstands in big towns in the UK. (Burda Easy isn’t published in English.) 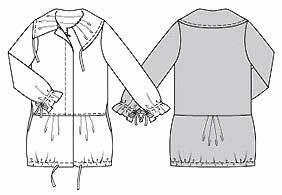 For KnipMode and Ottobre see Naaipatronen/SewingPatterns or Schnittmuster.net, and for Mrs Stylebook see Simply Pretty. Most of the magazine sources I’ve found are in Europe, and I mentioned them before. P.S. info about where to get pattern magazines in Australia here. And there are many marvelous resources for vintage patterns, which I’m not going to list here. Which are your favourite early winter 2010 patterns ? I’m going to take the easiest approach to being current in the coming winter, and just pick the early season BMV patterns I like. Which of this new season’s patterns (Butterick, McCall’s, Simplicity, Vogue) would make you feel and look happy, comfortable, and at your best ? If you were allowed to pick only one pattern for a jacket, one for a dress, one for a blouse/ top, etc., from these pattern collections, irrespective of what anyone else might think or say, which would it be ? – what would be similar that would be possible ? – are there some details that you could use ? – what is it about the style that you especially like ? I’m picking from the early season patterns issued June-July. There has already been an August issue from Butterick, and more patterns are due from McCall’s on Monday ! My choices include Butterick 5498 for a vest. I might round off the corners of the front shapes. 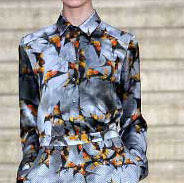 Lots of potential in this pattern, sleeveless or sleeved, a choice of collars and lapels. For my one choice for a knit jacket, there’s McCall’s 6168. Another pattern with several choices. The wrap style suits my need to keep my upper chest warm, better than the V-neck cardigan styles. And the McCall’s 6167 shirt. I think the dropped corners would be alright alone or under a classic vest. But to my taste a straight hemmed version would be better under the jacket or this vest. For a bag, I choose Butterick 5505, which has some backpacks that are more interesting than usual. When shopping I usually carry a basket. But a backpack is useful when I’m on a bike. If I was allowed to choose only one pattern, a wardrobe, it would be new Burda 7453 (sorry I can’t get a link to work). My choices from the early season BMV patterns don’t make a complete wardrobe, so here are some others to fill the gaps. My preferred pants are always the same style – faced waist, back zip, tapered leg. That suits my shape, so I won’t be changing. An absolute basic, like the narrower pants in Vogue 2779. But there are several current pant styles, which I’m planning a post on. My outerwear is nearly always a hooded parka, waterproof for summer, padded for winter. Happily parkas are in style this season. However there aren’t many fashion parka patterns available. It’s patterns for fashion parkas that are missing at the moment. Probably there are some in preparation. Burda is usually good for them. I have old favourites from Burda magazines (January 2008 and 2009). But even Burda haven’t got parkas currently in their main catalogue. 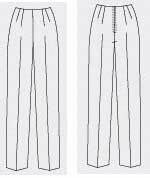 I like Burda 7750, discontinued but available for download. I very rarely have reason to wear a skirt or dress, and don’t need to add to my old standbys. Add my favourite thick big sweaters when they’re needed for warmth. 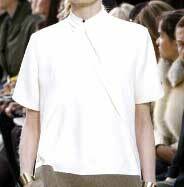 This is a quiet version of what magazine editors call the ‘country’ or ‘layered’ look for this winter 2010 season. Not what I would have chosen if I was still working. Not work/ party/ impress people clothes. But these suit me now. I would like wearing them, and they would fit in right well round here. That’s only 4 out of nearly 70 new patterns, so your choices are probably very different from mine. Have fun with the possibilities.